Afternoon Map - An Ottoman/Turkish/Middle Eastern/Balkan cartography blog bringing you a range of original, visually appealing and intellectually engaging maps harvested from archives and libraries around the world. Air University Map Room - World maps, country maps, major conflict maps, travel aids, map quick facts. American Congress on Surveying & Mapping - ACSM's members include more than 7,000 surveyors, cartographers, geodesists, and other spatial data information professionals working in both public and private sectors throughout the world. American Society for Photogrammetry & Remote Sensing (ASPRS) - A scientific association serving over 7,000 professional members around the world. Its mission is to advance knowledge and improve understanding of mapping sciences to promote applications of photogrammetry, remote sensing, geographic information systems (GIS), and supporting technologies. Andy Woodruff - Web cartographer who creates interactive web maps, from data to design to code. ArchiviaNet: Maps, Plans and Charts - Since its inception in 1872, the National Archives of Canada has acquired, preserved and commemorated the cartographic heritage of Canada. Today, these holdings include some of the earliest known visual representations of Canada and constitute the largest cartographic description of the country. Association of American Geographers (AAG) - 7,000 members share interests in the theory, methods, and practice of geography. Astrium - Provides Earth observation products for such diverse applications as agriculture, cartography, cadastral mapping, environmental studies, urban planning, telecommunications, surveillance, forestry, land use/land cover mapping, natural hazard assessments, flood risk management, oil and gas exploration, geology and civil engineering. Atlas of Canada - Places, digital maps, quizzes, facts, geographical information and learning resources about Canada. This Archive section contains over 1000 maps from previously printed collections. Atlas of the Baltic Sea Region - Descriptions/mapping of the countries in the Baltic Sea region. Bing Maps and Directions - Generate maps for cities, states, and provinces in the U.S. and Canada. Brechin, Gray, Ph.D. - An historical geogarapher, frequent radio and television guest, and a popular public speaker. He is currently a visiting scholar in the U.C. Berkeley Department of Geography and founder and project scholar of California's Living New Deal Project. Cartography Community Mapping (CCM) - Offers free mapping services to non-profit organizations such as Landcare groups. Maps can be provided in any of the standard graphical file formats (usually PDF) or as KMZ files for Google Earth and map capable GPS application. Colonial Roads - The American colonies in the 1700s. Cultural Maps in American Studies - To the extent that maps serve as guides not only to the physical terrain but also and importantly as charts of the mapmaker's mental and cultural terrain, of the memories and desires, anxieties and assumptions he projects upon any terra incognita, the University of Virginia has begun building an historical geography of America. CUNY Mapping Service - Engages with foundations, government agencies, businesses, nonprofits, and other CUNY researchers to use spatial information and analysis techniques to develop and execute applied research projects. David Rumsey Map Collection - The historical map collection has over 30,000 maps and images online. The collection focuses on rare 18th and 19th century North American and South American maps and other cartographic materials. Historic maps of the World, Europe, Asia, and Africa are also represented. DigitalGlobe - Imagery and information company: satellite imagery, geospatial data, remotedly sensed images, GIS, space imagery. Down Survey of Ireland - The mapping of Ireland carried out by William Petty, English scientist in 1655 and 1656. The survey employed about a thousand men and was performed with the promised rapidity, not by introducing new scientific methods, but by careful direction of the numerous subordinates among whom the labor was apportioned. Instead of using skilled surveyors, he completed the project using the now-unemployed - and cheap - soldiery. Also see Wikipedia. Earth Science Data and Information System (ESDIS) - Acquires, archives, manages and distributes Earth observation data. EOSDIS is NASA's contribution to the interagency Global Change Data and Information System (GCDIS). Enterprise Geographic Information System (EGIS): EZ/RC Address Locator - Allows you to determine if an address is located within an Empowerment Zone or Renewal Community in the U.S. This online tool can verify if a particular location is eligible for the tax incentives or other benefits in EZ/RC areas. ESRI - GIS and mapping software. Federal Geographic Data Committee - The FGDC is developing the National Spatial Data Infrastructure (NSDI) in cooperation with organizations from State, local and tribal governments, the academic community, and the private sector. The NSDI encompasses policies, standards, and procedures for organizations to cooperatively produce and share geographic data. FlowingData - Explores how designers, statisticians, and computer scientists are using data to understand ourselves better - mainly through data visualization. Visit Archives. Good examples: All 26 Million Road Segments in Continental United States and Every River System Mapped in World of Rivers. Furthest City - Have you ever wondered what cities are furthest away? What country really is on the opposite side of the world to you? Use Furthest City to search any world city with a population of over 100k. GeoCurrents - A map-illustrated forum dedicated to the global geography of current events. It provides historical background, regional analysis, and political and intellectual context for events, both major and minor, as long as they bear on larger issues and have a clear geographic expression. The site also emphasizes linguistics, as the spatial patterning of language and the geographical distribution of speech communities have profound bearing on the human condition. Geo.Data.gov - A web-based portal for one-stop access to maps, data and other geospatial services. Geographers - International directory of geographers. Geographic Names Information System (GNIS) - Contains information about almost 2 million physical and cultural geographic features in the U.S. The federally recognized name of each feature described in the data base is identified, and references are made to a feature's location by state, county, and geographic coordinates. The GNIS is the U.S. official repository of domestic geographic names information. Geography Network - Global network of geographic information users and providers sharing geographic information. The Geography Network offers content from a number of leading map and data providers. See Geography Network Publishers. GEOnet Names Server (GNS) - Access the National Imagery and Mapping Agency's (NIMA) database of foreign geographic feature names. Geospatial and Attribute Data - Links to hundreds of maps and Geographical Information Systems data sets held by federal, state, and local agencies. Getty Thesaurus of Geographic Names (TGN) Online - Contains over 1 million place names representing approximately 900,000 places. GIS Data Depot - GIS and geospatial data. GIS Dictionary - Terms related to operations such as analysis, GIS modeling and web-based GIS, cartography, and Esri software. GISGeography - Provides Geographic Information Systems (GIS) and geography information. Global Incident Map - A global display of terrorism and other suspicious events. Goggles - A flight sim that uses images loaded from Google's mapping service. Google Earth - Want to know more about a specific location? Google Earth combines satellite imagery, maps and the power of Google Search to put the world's geographic information at your fingertips. Google Maps Gallery - Also see Google Blog entry introducing Google Maps. Indoor Maps - View and navigate floor plans of several commercial locations such as airports, department stores, malls, and more within Google Maps. Libraries411 - Local government data. Google Maps Mania - An unofficial Google Maps blog tracking the websites, mashups and tools being influenced by Google Maps. Google Sightseeing - Go sightseeing around the globe with satellite images from Google Earth and Google Maps. Google Street View - Lets you explore places around the world through 360-degree street-level imagery. Green Map System - A Green Map charts the places where nature and the designed world interconnect, using Green Map icons to symbolize the different kinds of ecologically and culturally significant sites, including the toxic hot spots. All decisions about each Green Map are made locally, so the final products vary widely. Many focus only on beneficial natural sites, and sometimes Green Maps are merged with another kind of map, such as a bicycle map. Many include narrative text and background info on each of the sites identified by the icons. See List of all the Green Maps. Hand Made Maps - Map illustration studio - London. Hargrett Rare Book & Manuscript Library: Map Collection - The University of Georgia maintains this collection of more than 800 historic maps spanning nearly 500 years, from the sixteenth century through the early twentieth century. The collection provides a graphic resource upon which scholars can draw in re-discovering the minds and movements of early American explorers, revolutionary statesmen, cultural figures and politicians represented by the library's book and manuscript collections. Harvey, David (Wikipedia article) - David Harvey (born 1935) is the Distinguished Professor of Anthropology at the Graduate Center of the City University of New York (CUNY). A leading social theorist of international standing, he graduated from University of Cambridge with a PhD in Geography in 1961. He is the world's most cited academic geographer and the author of many books and essays that have been prominent in the development of modern geography. His work has contributed greatly to broad social and political debate. Historic Cities - This site contains maps, literature, documents, books and other relevant material concerning the past, present and future of historic cities and facilitates the location of similar content on the web. Historic Maps Declassified by the CIA - A gallery providing a look inside the 75-year history of the agency's mapping unit. Historical Atlas of Canada - The Historical Atlas of Canada project published three volumes which explored major themes and episodes in the history of Canada using maps, text and graphics. Now, the Online Learning Project makes many of the maps and much of the research data created for the Atlas available online. Historical Atlas of the Twentieth Century - Interactive maps. Also see Links to Historical Maps on Otehr Sites. Historical Maps of the U.S. - Perry-Castañeda Map Collection - UT Library Online. Historical Maps Overview - Scans from early 20th-Century historical atlases. 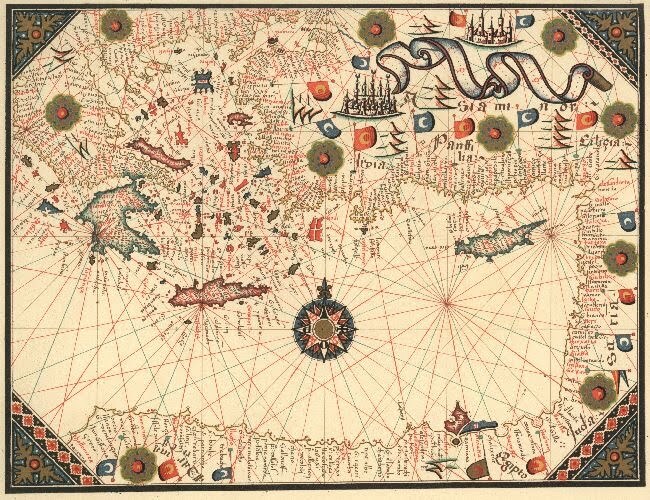 History of Cartography Project - A research, editorial, and publishing venture drawing international attention to the history of maps and mapping. The Project's major work is the multi-volume History of Cartography series. Its inter-disciplinary approach brings together scholars in the arts, sciences, and humanities. Organized by region and time period, The History of Cartography looks at maps in the context of the societies that made and used them. The volumes integrate existing scholarship with new research, examining an unprecedented range of artifacts from local maps to those of the cosmos. The books are extensively illustrated and contain detailed footnotes, appendixes, and reference maps. The award winning series, founded by J. B. Harley and David Woodward, is now edited by a team of scholars and published by the University of Chicago Press. How Far Is It? - Uses data from the U.S. Census and a supplementary list of cities around the world to find the latitude and longitude of two places, then calculates the distance between them. Human Geography - Journal covering topics ranging from geopolitics, through cultural and economic issues, to political ecology. Immersive Media Corp. (IMC) - IMC's immersive movies can integrate GIS coordinates and other metadata producing our GeoImmersive video. IMC's offerings include hardware, software, camera and post-production services, and immersive imagery available for licensing. Applications include: urban planning, oil and gas resource management, emergency response and first responder operations, and commercial media. Google's Street View using IMC's technology. Inforain GIS - GIS data to create regional and community databases based on watershed boundaries. Data layers are available for download and interactive mapping applications provide functionality similar to that of sophisticated GIS software. Journal of Transport Geography - Focuses on transport policy practice and analysis in the wake of political and policy changes, huge transport infrastructure projects and responses to urban traffic congestion. Land Processes Distributed Active Archive Center - Established as part of NASA's Earth Observing System (EOS) Data and Information System (EOSDIS) initiative to process, archive, and distribute land-related data collected by EOS sensors. Library of Congress: Geography and Map Reading Room - Maintains custody of the largest and most comprehensive cartographic collection in the world with collections numbering over 4.5 million maps including 60,000 atlases, 6,000 reference works, numerous globes and plastic relief models, and a large number of cartographic materials in other formats, including electronic. These cartographic materials date from fourteenth century portolan charts through recent geographic information systems data sets. Library of Congress: Map Collections - The focus of Map Collections is Americana and Cartographic Treasures of the Library of Congress. These images were created from maps and atlases and, in general, are restricted to items that are not covered by copyright protection. Map Collections is organized according to seven major categories. A map or collection of maps which portrays a subject or multiple subjects is found under the category which includes the main subject. For example, maps of the national parks are found in Conservation and Environment; a map of the Lewis and Clark expedition is in Discovery and Exploration; maps used by the American Colonization Society during the settlement of Liberia are in Immigration and Settlement; and when they become available, Civil War maps will be in Military Battles and Campaigns and railroad maps will be in Transportation and Communication. Major Biomes of the World - Presents the structure, characteristic growth forms, and taxonomic affiliations of the vegetation; major soil orders; and common adaptive characteristics of the fauna of the tundra, boreal forest, temperate broadleaf deciduous forest, tropical broadleaf evergreen forest, tropical savanna, temperate grasslands, desertscrub, and Mediterranean shrub biomes. Map a Planet - Explore global imagery of the planets and satellites from a variety of missions in an easy to use web interface. Customize and download your own image maps of the Moon, Mars, Venus, and other planets and moons. Map History / History of Cartography - Comment, guidance, and over 3,000 annotated links to old maps, early maps - non-current maps in general. Map Room - A weblog about maps. All about finding maps, map collections, map-related resources, and material about maps on the web. MapToGround - MapToGround selects UNOSAT and WFP Logistics Cluster humanitarian maps that are useful for handheld GPS device application and that include georeferencing data. For each of these maps MapToGround provides a georeferenced OziExplorer MAP file and a KMZ file for map capable Garmin GPS units. Also on this site there is information on GPS and map basics, OziExplorer and a discussion of the use of KMZ and GPX files with Google Earth and handheld GPS devices. In addition there is a design toolbox which contains some elementary tools for refugee camp design. Mappy (France) - European route planner. Maps of Paris, London, and other big cities. Tourist and practical information. Maps About Maps - This project is a series of interviews on an interactive map. It is built on open source software and Google Earth. The idea of of the interactive map allows one to layer and juxtapose information to make connections with our knowledge of the world. It explores what people think the concept of maps and its functions means to them from artistic to functional - a map about maps. This interactive system can bring people together, virtually sharing their knowledge, thoughts and opinions. These layers are not static, they change as more people contribute their stories. The goal is for people to communicate through social software, learn, and explore in the virtual world using maps. In so doing, they can learn about each other's cultures, geographies, and communities. Mapbox - Helps you design beautiful maps and publish them across the web and mobile devices at scale. MapForum - Specialist antique map magazine. mapsarea - Directory of world maps, atlases, weather maps sites; map libraries; interactive maps; historical maps. MDA Geospatial Services - The leading provider of advanced geospatial information products derived from the high-resolution RADARSAT satellites, commercial optical satellites, and aerial systems. Measuring and Mapping Space: Geographic Knowledge in Greco-Roman Antiquity - A selection of objects that help viewers understand how Greek and Roman conceptions of the world were reflected in and defined by how it was presented in globes, maps, and other tools of navigation and representation. A digital component of the exhibition-accessible both in the gallery space itself and on the world-wide web-extends the show's reach to embrace continuing scholarly engagement with geographical aspects of antiquity. Maintained by NYU's Institute for the Study of the Ancient World. Metacarta - MetaCarta's products combine text and maps, so analysts can filter and visualize the geographic meaning of text documents. These documents can then be searched using keywords, metadata, and geographic extent using the MetaCarta Map Search Text Index, which offers blindingly fast search speeds based on a patent-pending algorithm that combines geography and text. NASA Library of Remote Sensing - Satellite remote sensing. National Geographic: Maps - Browse through National Geographic maps in its print map collection and Atlas Explorer, explore your world with MapMachine, and enjoy map-based editorial features like EarthPulse. National Geographic Society - One of the largest non-profit scientific and educational institutions in the world. Its interests include geography, archaeology and natural science, the promotion of environmental and historical conservation. The National Geographic Society has been inspiring people to care about the planet since 1888. Also see more National Geographic map products here. National Geospatial-Intelligence Agency - Primary source of geospatial intelligence, or GEOINT for the Department of Defense and the U.S. Intelligence Community. National Imagery and Mapping Agency - Imagery, imagery intelligence, and geospatial information. National Library of Scotland: Maps of Scotland - Earliest surviving detailed maps of Scotland, made by Timothy Pont over 400 years ago, in the 1580s and 1590s. Access high-resolution zoomable images of over 20,000 maps of Scotland. National Map - A collaborative effort among the USGS and other Federal, State, and local partners to improve and deliver topographic information for the U.S. It has many uses ranging from recreation to scientific analysis to emergency response. The National Map is easily accessible for display on the Web, as products and services, and as downloadable data. The geographic information available from The National Map includes orthoimagery (aerial photographs), elevation, geographic names, hydrography, boundaries, transportation, structures, and land cover. Other types of geographic information can be added within the viewer or brought in with The National Map data into a Geographic Information System to create specific types of maps or map views. National Ocean Service (NOS) Data Explorer - Provides access to many products, including bathymetry, coastal maps, environmental sensitivity index maps, aerial photographs, and more. Natural Atlas - Topo maps of the outdoors. Waterfalls, campsites, trails, mountains, springs, and other outdoor features. Old Maps Online - One search, centralized access to multiple digitized historical map collections. Open GIS Consortium (OGC) - An international industry consortium of 253 companies, government agencies and universities participating in a consensus process to develop publicly available geoprocessing specifications. OpenStreetMap - A free editable map of the whole world, aka The Free Wiki World Map. Pease Press Cartography - Designs maps for books, displays, brochures and websites. Russian Geogrsphical Society - The oldest scientific organization in Russia that has been uniting professional geographers and other scientists, public figures and geography buffs since 1845. Satellite Imaging Corporation - With over a decade of experience in acquiring satellite images and airborne-sensed data, Satellite Imaging Corporation (SIC) provides top quality satellite images and other remote sensing products, geographic information system (GIS) projects, and consultancy services. Scimaps.org - Using the power of maps to help understand, navigate, and manage both physical places and abstract knowledge spaces. SkyIMD - Designs and develops complete aerial imaging solutions for light planes and helicopters. Its systems have been deployed for use in the U.S., Honduras, Australia, South Africa, Brazil, France and Canada to assist with a multitude of imaging needs. Something About Maps - Blog from cartographer Daniel Huffman. TERRA - NASA's Earth Observing System has begun an international study of planet Earth that is comprised of three main components: 1) a series of satellites specially designed to study the complexities of global change; 2) an advanced computer network for processing, storing, and distributing data (called EOSDIS); and 3) teams of scientists all over the world who will study the data. TerraFly - Simply enter an address, and our system will put you at the controls of a bird's view aerial imagery to explore your digital earth. TerraServer - Contains 3.3 tera-bytes of high resolution aerial imagery and topographic maps. You can locate imagery by clicking on a map, entering a city or town name in the Search TerraServer form, or entering a U.S. street address. Thomas Maps - If you are looking for a Rand McNally Map, Thomas Brothers Guide, Mapsco Maps, Kappa Map Group or road atlases, you'll find them here. Topologically Integrated Geographic Encoding and Referencing (TIGER) System - U.S. Census geography information. The U.S. Census Bureau offers several file types for mapping census geographic data based on data found in our MAF/TIGER database. TopoZone - Free USGS maps for the United States. Tribal Nations Maps - Comprehensive maps of pre-contact and at-contact Native North America. These maps use Tribal Nation's original indigenous names for themselves, and show where Tribes were just before contact with outsiders, as well as the last homelands they defended. The intent of these maps is to instill pride in Native peoples and to be used as teaching tools from a Native perspective. U.S. Antarctic Resource Center (USARC) - The USARC at the U.S. Geological Survey (USGS), Reston,Va., maintains the Nation's most comprehensive collection of Antarctic maps, charts, satellite images, and photographs produced by the U.S. and other member nations of the Scientific Committee on Antarctic Research (SCAR). U.S. Board on Geographic Names - Maintains uniform geographic name usage throughout the Federal Government. U.S. Cities Gazetteer HomeTownLocator (HTL) - Data for 42,500 cities, towns, and zip codes. HTL profiles include census, demographic and income data, parks, schools, libraries, hospitals, airports, hotels, environmental conditions, local newspapers, media outlets, employment, maps, coordinates and aerial photos. U.S. Geological Survey (USGS) - A bureau of the Department of the Interior providing scientific information to describe and understand the Earth; minimize loss of life and property from natural disasters; manage water, biological, energy and mineral resources. Also see USGC Digital Maps: A New Generation of Maps. These digital maps are built from The National Map data, which are integrated from local, State, Federal, and other sources. The initial version of the Digital Map - Beta includes orthoimagery plus roads and geographic names in the traditional 7.5 minute quadrangle format. Digital Maps - Beta are available free on the Web in the GeoPDF format. File size is about 15 to 20 Megabytes. Earth Resources Observation Systems (EROS) Data Center - A data management, systems development, and research field center for the U.S. Geological Survey's (USGS) National Mapping Division. EarthExplorer - Query and order satellite images, aerial photographs, and cartographic products. LandsatLook Viewer - Interactively explore the Landsat archive at up to full resolution directly from a common Web browser . U.S. National Map - Provided by the National Mapping Division (NMD) of the U.S. Geological Survey (USGS). United Nations Geographic Section - More than 100 general maps are available. University Consortium for Geographic Information Systems (UCGIS) - A non-profit organization of universities and other research institutions dedicated to advancing the understanding of geographic processes and spatial relationships through improved theory, methods, technology, and data. University of Chicago Library Map Collection - One of the largest university map libraries in North America. Its 430,000 maps, 10,000 air photos, 2000 books, and hundreds of gigabytes of spatial data constitute a rich source of information for scholars and other users. Particularly strong holdings of: (1) topographic maps; (2) urban maps; and (3) thematic maps. USGS National Geospatial Program - Standards set the criteria and specifications to ensure that all products prepared by the USGS under the National Geospatial Program (formerly the National Mapping Program) are accurate and consistent in style and content. Most of these standards are historical and apply to products no longer produced by the USGS. Geospatial data is now provided through the National Spatial Data Infrastructure (NSDI) website. USGS U.S. Board on Geographic Names - The U.S. Board on Geographic Names is a Federal body created in 1890 and established in its present form by Public Law in 1947 to maintain uniform geographic name usage throughout the Federal Government. The Board comprises representatives of Federal agencies concerned with geographic information, population, ecology, and management of public lands. Sharing its responsibilities with the Secretary of the Interior, the Board promulgates official geographic feature names with locative attributes as well as principles, policies, and procedures governing the use of domestic names, foreign names, Antarctic names, and undersea feature names. VisualComplexity - A resource space for anyone interested in the visualization of complex networks. Walker, Richard, Ph.D. - U.C., Berkeley Professor Walker's research is focused on economic geography, regional development, capitalism and politics, cities and urbanism, resources and environment, California, class and race. Professor Walker's best known work is in economic geography, especially The Capitalist Imperative: Territory, Technology and Industrial Growth (Blackwell, 1989), with Michael Storper - one of the most cited books in the field. Wikimapia - An enhancement of Google Maps. World Sites Atlas - Maps of continents/regions, countries, states, and provinces. WorldAtlas - An atlas of maps, flags, geography facts and more. This webpage last updated on Wednesday, April 11, 2018 4:40 PM.